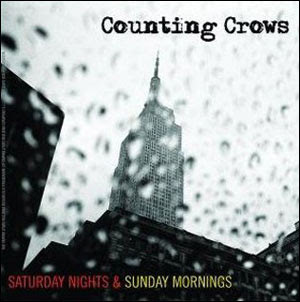 When today’s random song popped up, I was reminded of how disappointed I was in Counting Crows’ 2008 album, Saturday Nights & Sunday Mornings. The concept was half an album of upbeat songs and half an album of slow ballads. What they ended up with was a Goldilocks selection without anything that was “just right.” The first half was annoying and off-putting while the second half put me to sleep. The latest Counting Crows album suffers from Goldilocks Syndrome — parts of it are too hard, parts are too soft and the rest is just about right. The concept here was that the record’s first half represents the “Saturday nights,” with hard-rocking and much mayhem, while the rest calls to mind “Sunday mornings,” and the gentler comedowns they provide. The idea would have worked better over two discs, but presented as one album of fourteen songs it seems less like a high concept than a purposeless and jarring shift in tone.